This year, my husband and I decided that doing a "Thankfulness Project" with our boys would be a good way to teach them about gratitude, thinking of others, and where the Thanksgiving holiday came from. I think that this has not only been good lesson for them, but also a good exercise for me. Gratitude is a great way to keep things in perspective, especially after a recent flare and feeling frustrated and down. Since our boys are quite young, we are keeping it simple, so as to keep their interest and because I didn't want to set us up for failure (as we all know, life can derail us - why set the bar too high for our first attempt at this?). 1. Sharing what we are thankful for each night at dinner. This has been easy and fun! We are also writing down the responses each child has, as it will be fun to look back at when they are older. This exercise has been particularly entertaining with the 3-year-old, mostly because of our timing for doing this in the day - he's often thankful for food (most often, "Mac-n-Cheese", even if that's not what's for dinner!). 2. Identifying at least one person we are thankful for and expressing our gratitude for them. We have not yet figured out what our "grand gesture" will be, but we have worked on Thank You notes for people who have expressed acts of kindness, and talked about how thankful we are for their actions, as well as how important it is to express our thanks (we already do this for gifts received, but it's still a good lesson outside of that). 3. 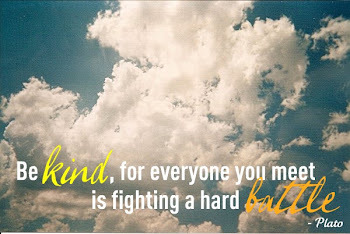 Finding a charity that serves someone less fortunate than we are and giving back. For this, we actually selected two charities. The first charity is a local hunger relief organization that we contributed money to. While we did discuss what we are doing, why, and the fact that not all families can put food on the table, it's still a pretty abstract concept to children to see their parents write a check. So, we also decided to do something more "hands on" by giving a gift to a young boy via "Operation Christmas Child" through Samaritan's Purse. 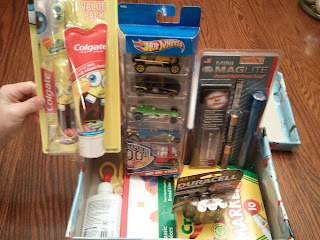 Our oldest helped me shop for items to fill our shoe box, and we had a blast doing it! We are going to "follow our box" to see where in the world it ends up. It should be a fun lesson! We had a great weekend - I hope you did, too.